Autobella uses a proprietary process to remove door dings, small dents, hail damage and other common forms of minor body and sheet metal damage from all vehicle types without using conventional auto body repair techniques like hammering, grinding, filling and repainting. 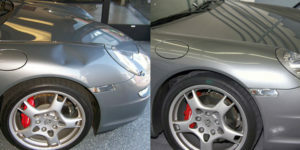 Autobella does not use any paint during the PDR repair procedure, and our process will not damage the existing finish. This process totally eliminates the possibility of paint mismatch, variables in weathering of painted panels, and over spray on other areas of your car. Autobella’s proven technique removes typical small dents in about an hour. In most cases, the repair can be accomplished while you wait or while your car is being detailed. Unlike conventional forms of auto body repair, with this process there is no possibility of shrinkage, cracking, sanding lines or paint texture differences – and it’s permanent. Our price is considerably less than the cost of traditional body shop repairs. In fact, show us your body shop estimate, and we’ll charge you less than half their cost (excludes hail damage).